In my mind, Pixar is a total bastion of creativity and originality in the film industry, which many are saying is becoming less and less creative as the days go on. Every year Pixar release a project that is endlessly creative and inventive when it comes to the settings of the film. However, with the recent announcement at last year’s Disney Conference that Pixar will be releasing a whole host of sequels over the next few years, fears were, and to an extent still are, quite high that their originality is being stamped out in favour of a more business friendly cash cow. It’s my absolute pleasure then to write that Inside Out is, undoubtedly, one of the most unique projects Pixar have developed in the last few years, perhaps since Wall-E. Our main character is Riley, and eleven year old girl who is going through life changing events in her life. Rather than watch the action play out from her perspective though, we instead see it from the wholly unique perspective of her five chief emotions, Sadness, Disgust, Anger, Fear and the main emotion, Joy. Inside Out can be seen as one large extended metaphor, but its core message is heartfelt and relatable. Inside Out is a great romp through the mind of an eleven year old girl, cracking wise about concepts like Déjà vu and the imagination, but in the end, the overarching theme is more mature than what I personally could have ever expected from a Pixar movie. It’s a change from form, and a greatly heartfelt one at that. Joy (Amy Poehler) is our guide through the world of the mind, and it’s through her that we understand the world which has been set up. One of the main stumbling blocks Inside Out could have tripped up on could have been the complex way the world has set up. Save for a large exposition dump near the start of the film, director Pete Docter lets the audience learn about this world through the experiences of our characters. Concepts like long and short term memory, personality and the sub conscious are all creatively manipulated to make it more than accessible to all audiences, both young and old. It’s more than worth mentioning then that the voice actors are absolutely vivacious and full of life. I won’t spoil anything, but is a character introduced in the second act that absolutely steals the show. The voices breathe life into these potentially one note characters, and contrary to what trailers may have you believe, each of the emotions do experience other emotions that aren’t their own name-sake. 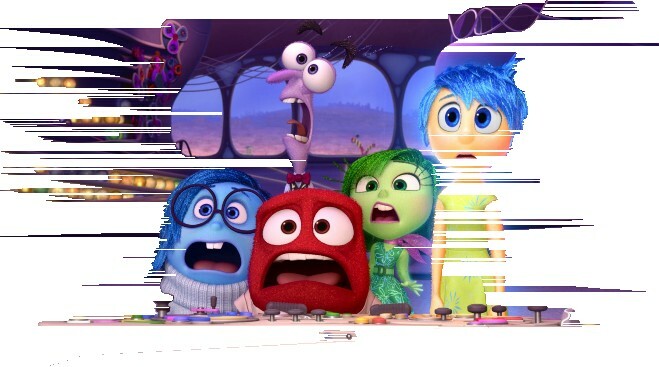 Unfortunately, as much as the setting of Inside Out is very creative and intuitive, the plot is not. If you’ve seen any conventional blockbuster in the last year, you know how the plot of Inside out is going to turn out. The Three-Act Structure is adhered to with frightening strictness making the plot anything but unexpected. In fact, many have pointed out that the story of Inside Out is one that follows almost the exact same beats the Pixar classics such as Toy Story, Finding Nemo and Up. Of course this won’t be an issue, nor a concern for children or in fact most adults who watch this film, it’s just a troubling feature in many of Pixar’s films that is worth pointing out. That being said though, the resolution to the plot is one that I honestly wasn’t expecting, and the overall theme wasn’t something akin to, “Happiness is the best and you should always be happy,” but something far more emotionally complex and in the end, emotionally rewarding. Inside Out is a pleasant film, one that defies the convention of the normal themes that are employed by animated kid’s movies, but strictly adheres to the predictable and ultimately inconsequential plot points. If you’re looking for something in the cinema this weekend that is fun and accessible, then Inside Out will have you covered.